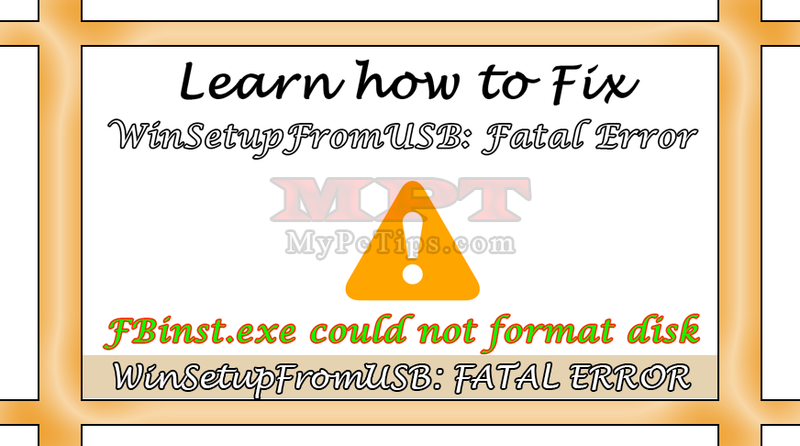 If you are an user of WinSetupFromUSB then you know about it and if having the issue with Fatal Error while checking Autoformat feature during making of Bootable USB Flash Drive. And if you don't know about it so here is, WinSetupFromUSB is a freeware program which allows users to make USB driver bootable with Windows XP, WIndows Vista, WIndows 7, Windows 8 and also Linux Windows. The is the best tool for making bootable USB and it will allow multi-booting feature. Yes you can also make USB Bootable with multiple Windows. 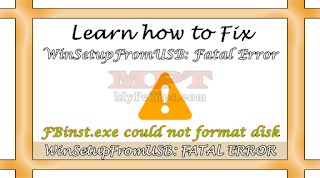 So lets back to the topic, during use of this Tool I face the issue while checking Autoformat before preparing bootable USB, it again and again showed me Fatal Error - FBinst.exe could not format Disk. I have tried to solve this temporary issue and I have succeeded to resolve it and then I decided to make a small video over it to make awareness among those mates who are facing the subject similar error. While manual format will also work with it but many time auto-format is required. Let's start fixing this issue, although it's not a issue or bug from WinSetupFromUSB it's some malicious issue with few programs, same is occurring here too. Run or Launch "WinSetupFromUSB" Program. Now just "TURN OFF" or "DISABLE" your Anti-Virus Real-Time Protection Temporarily/Until Next Boot. You're ready to Check on "AUTO FORMAT IT WITH FBINST". Just do your work now with WinSetupFromUSB. After "JOB DONE", just re-enable your Anti-Virus Protection. Remember, it's the Anti-Virus which was blocking Auto-format program to Run.